We regularly make and fit new tubes to Avon Searider 4.5m RIBs. Below are a selection of retubes we have completed for a varierty of customers who use their boats for various purposes including leisure, diving and as safety boats. The Military Grey RIB, belonging to The Ahoy Centre in London, has been retubed to our standard TIDEL Specification (strake, fairlead, 4 handles, 2 pairs of wear patches and lifelines). Pictured alongside it, is the Ocean Blue Searider, belonging to Grenville House, Devon, with it’s Sunflower Yellow wear patches has a few extras on top of our standard specification. Both these boats are being used to enable youngsters, in particular, to enjoy various water sports and activities. 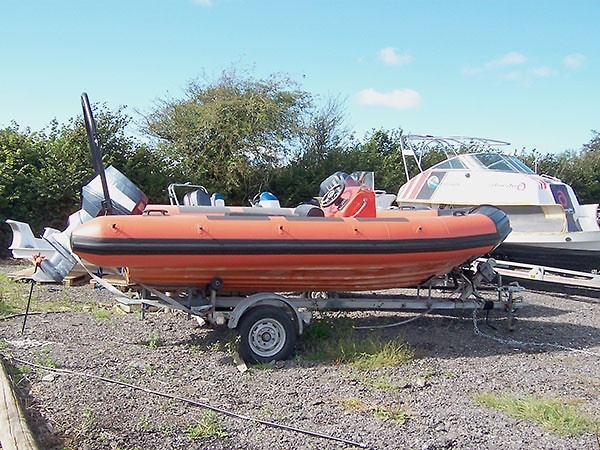 Avon Searider 5.4 mtr Dive Boat RIB retubed in Sylvano Orange hypalon with Big D rubbing strake, webbing patches for lifeline holders, black wear patches and extra reinforcing in the bows (flat black strake). While your Bernico RIB is with us for retubing we can also carry out Fibreglass ( GRP ) and Hull Repair, Electrical system maintenance and RIB boat engine maintenance tasks. We aim to be very competitive on rib retubing cost so please contact us for a no obligation retube price quote for your Bernico RIBs.